As part of Warner Bros’ big San Diego Comic-Con 2017 panel in Hall H, the movie studio released this killer Justice League teaser one sheet movie poster! Some lucky fans even got the poster below signed by the cast. Just check out eBay to see what crazy amounts these posters are going for now on the secondary market! As most are pointing out, it seems pretty clear that the poster’s layout is based on Alex Ross’ iconic Justice League painting for a previously released DC Comics posters and comic books. 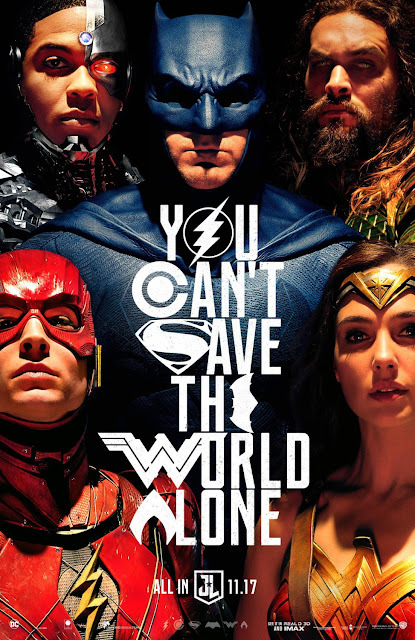 I really love how they incorporated all six heroes' logos into the poster's text. The Blot’s got no idea why Warner Bros continues to keep Superman out of the film’s trailers and posters - because we all know he’s going to appear - but at least they included his S-shield symbol in the text of this one sheet. Best of all, I can’t get over how heroic Batman, Wonder Woman, Aquaman, The Flash and Cyborg look here. Hopefully the movie can look this good!